Music has always been an important part of my life. I grew up going to church, and I loved to sing. I began playing the piano when I was in the second grade. Each year, our family would attend a family camp in Oklahoma. Janet Hudson led the music for the children most years. She was a pastor's wife from Ohio when I first knew her although her family later moved to Northern Kentucky. One of the choruses that she taught us to sing was taken directly from the Bible. I've learned other tunes to that verse since my first encounter with it in my early elementary years, but it's a song that I'll never forget. It's also a Bible verse that I will never forget. It's also a verse that I hope America does not forget! A lot of us who are descended from the Perkins family of Ipswich, Massachusetts know that we can trace our ancestry back to the Hillmorton parish which is on the outskirts of Rugby in Warwickshire, England. I've been working on a project at work where we are downsizing our reference collection and came across a duplicate copy of a reference work, which, of course, meant that the duplicate would be withdrawn from the library's collection. I decided that it wouldn't hurt to look to see if there was an entry for Hillmorton in the volume since it was coming across my desk. To my delight there was! Ekwall, Eilert. The Concise Oxford Dictionary of English Place-Names. 3rd ed. Oxford: Clarendon Press, 1947. Hillmorton Wa [Mortone DB, Hulle, Morton 1252 Fees, Hullemorton 1265 Ch]. Originally two places HILL and MORTON, later thrown into one called Hillmorton. Obviously, the Wa is the book's abbreviation for Warwickshire. DB is the abbreviation for the Domesday Book, so obviously the Morton part existed in 1086. Fees is the abbreviation for The Book of Fees. It appears we are dealing with two separate locations in 1252. Ch is the abbreviation for Charter Rolls. The two locations had merged to form one place by 1265. It's a rather interesting entry that tells me a little more about a place my ancestors lived. Arnold, Caroline. Children of the Settlement Houses. (Picture the American Past). Minneapolis: Carolrhoda Books, 1998. While this book does offer an overview of settlement houses, why they sprang up, and the activities children would have done at them, it was more of a dry narrative than something that was personal and touching. By taking a slightly different approach to the book and incorporating a more personal approach, the author could have incorporated all that and made it a reading experience that would linger with her readers. There are not, however, a lot of books that address the topic, so it is still a useful book to use with children whose urban immigrant ancestor might have enjoyed some of the activities at these homes. The book is illustrated by black and white photographs depicting persons who were a part of these homes. 3 stars. Craughwell, Thomas J. Thomas Jefferson's Creme Brulee: How a Founding Father and His Slave James Hemings Introduced French Cuisine to America. Philadelphia: Quirk Books, 2012. The author claims that Thomas Jefferson's decision to take his slave James Hemings (brother of Sally) to France to study French cuisine changed the culinary landscape of America. Unfortunately the author did not make a very convincing argument and failed to adequately address how the impact could have come when Hemings died at such a young age. Certainly the author mentions that Jefferson had other slaves trained in French cuisine; however, that was not addressed enough to show an impact. While Jefferson's foods may have been know in his circle of friends, it does not have seemed to have impacted the food of the common man. I will continue to think of Julia Child as the one who brought (or at least reintroduced) French cuisine to the common man (and woman) in America. The author did a fairly good historical treatment of Jefferson in the years in which he was in France. The writing itself is not particularly absorbing, but the food descriptions are more captivating. The facsimiles of surviving recipes of Jefferson and Hemings were printed in the back. This review is based on a copy received through LibraryThing's Early Reviewer program with an expectation that a review would be written. Ira Lantz was born 16 July 1873 in Howard County, Indiana. He first appears on the 1880 census with his parents, Samuel and Elizabeth. 1880 U.S. Census, St. Joseph County, Michigan, population schedule, Mottville Twp., p. 503B (stamped), s.d. 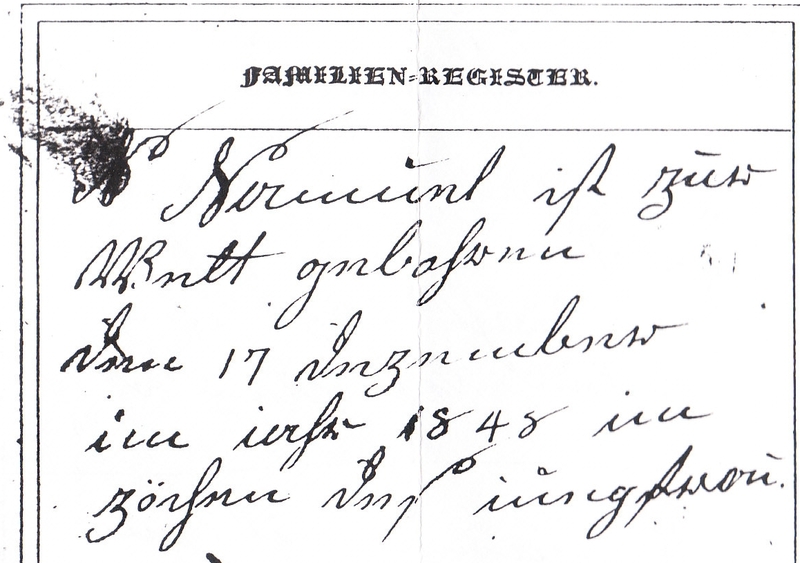 1, enumeration district (ED) 283, sheet 8, dwelling 83, family 84, Samuel Lantz household; Ancestry. com (http://www.ancestry.com : 18 May 2001); citing NARA microfilm publication T9, roll 603. 1900 U.S. Census, McPherson County, Kansas, population schedule, Superior Twp., p. 207A (stamped), s.d. 7, enumeration district (ED) 151, sheet 5A, dwelling 80, family 81, Ira Lantz household; Ancestry.com (http://www.ancestry.com : 24 Sept 2012); citing NARA microfilm publication T623, roll 488. Following the family becomes a bit more challenging at this point. In the 1910 census, I have been unable to find Mabel and the children; however, I did find Ira. There are some discrepancies in the record. He's in Washington, D.C. in what I would assume to be a large apartment complex or hotel. I need to find something that will tell me what was at the address at the time. He is listed as single, and the mother's birthplace is wrong. The mother's birthplace could be an error on the enumerator's part in recording or in copying it. There are numerous possibilities as to why he is listed as single, but the most probable one is that it is simply because the informant did not know his family was still out west and not living with him. 1910 U.S. Census, Washington, District of Columbia, population schedule, Precinct 6, p. 115B (stamped), enumeration district (ED) 115, sheet 17A, dwelling 300, family 365 [i.e. 375], Iral Lantz; Ancestry.com (http://www.ancestry.com : 24 Sept 2012); citing NARA microfilm publication T624, roll 152. Lantz, Iral, Head, M, W, 37, S, Indiana, Ohio, Maryland, English, clerk, Interior Dept. The next family finds him reunited with his children, but his wife is missing. He is still listed as "married," but it's possible that is erroneous and that he is already widowed. He has literally crossed the country. He is now found in Alameda County, California. 1920 U.S. Census, Alameda County, California, population schedule, Oakland Twp., Albany City, Ward 3, p. 66A (stamped), s.d. 5, enumeration district (ED) 162, sheet 10A, dwelling 207, family 207, Ira Lantz family; Ancestry.com (http://www.ancestry.com : 24 Sept 2012); citing NARA microfilm publication T625, roll 92. From this 1920 census, I learned that Ira had been in Oklahoma around 1902 or 1903. I used that information when trying to locate the family in the 1910 census. I still was unable to locate them. I'd really like to ask Ira where he hid his family while he was clerking in the nation's capital. 1930 U.S. Census, Alameda County, California, population schedule, Berkeley City, Pct. 96, p. 115B (stamped), s.d. 8, enumeration district (ED) 297, sheet 15B, dwelling 261, family 284, 2430 Jefferson Street, Ira Lantz household; Ancestry.com (http://www.ancestry.com : 24 Sept 2012); citing NARA microfilm publication T626, roll 111. Ira was fortunate enough to be enumerated twice in 1940--once in Los Angeles and once in Berkeley. 1940 U.S. Census, Los Angeles County, California, population schedule, Los Angeles, 44 Assembly Dist., Carmalmame D9 ward, p. 1921 (stamped), s.d. 14, enumeration district (ED) 60-745, sheet 83A, visit T, Stowell Hotel, 416 S. Spring St., Ira Lantz; Ancestry.com (http://www.ancestry.com : 24 Sept 2012); citing NARA microfilm publication T627, roll 378. 1940 U.S. Census, Alameda County, California, population schedule, Oakland Twp., Berkeley City, p. 1883 (stamped), s.d. 6, enumeration district (ED) 1-121, sheet 14A, visit 325, 2430 Jefferson Avenue, Ira Lantz household; Ancestry.com (http://www.ancestry.com : 24 Sept 2012); citing NARA microfilm publication T627, roll 188. We can assume that Ira married second wife Carrie sometime before 1835 since she was living in the same house in 1935. Ira's death is found via the California death index. I will need to acquire the vital record in the future. "California Death Index, 1940-1997," database, Ancestry.com (http://www.ancestry.com : accessed 24 Sept 2012), entry for Ira Lantz. 10 Apr 1950. This death index does provide some support to his mother's maiden name although his children are likely the informants. I really think that I need to visit the National Archives in San Francisco which has records of the General Land Office where Ira worked. I would also like to see if there are records of his time clerking in the nation's capital, but those will likely be in the DC area. In the 1900 census. Samuel's wife Elizabeth is listed as the mother of 9 chilren, 7 still living. The two deceased children never made it onto a census. I will add those two (with rough citations) to the list. 1. Sidney F. Lantz (b. 20 May 1872, Howard Co., Ind. ; d. 4 Aug 1872, Howard Co., Ind. ; bur. Amish Family Cemetery, Howard Co., Ind.) [See http://www.khcpl.org/glhs/cemeteryIndex/ijkl.html ; I have a transcription from a cemetery book that I cannot find and which is apparently not in my database. The transcription itself was dated in 1968, as I recall. It is probably Gorman, James L. Cemetery Inscriptions of Eastern Howard County, Indiana: Including the Townships of Howard, Jackson, Liberty, Taylor, and Union. (Kokomo, Ind. : Selby, 1991). The cemetery is located at 400 N and 590 E and is sometimes also called Lantz Cemetery. It is very small. I have been unable to locate this cemetery on more than one visit. All the recorded burials in this cemetery are related to me. 2. Ira Lantz (b. 16 July 1873, Howard Co., Ind. ; d. 16 July 1873, Alameda Co., Calif.) - I'll be providing documentation on him later this week. I'll be reporting findings on each child in later posts with the exception of the two who died young. Waddell, Dan. The Blood Detective. New York: St. Martin's Minotaur, 2008. Genealogist Nigel Barnes is enlisted by DCI Grant Foster and detective Heather Jenkins when they find numbers that remind them of vital records numbers carved into a body. It's a case of past meets present where what happened in 1879 is eerily similar to what is happening in the present. Barnes utilizes a variety of records and repositories in his research. Readers are able to see Barnes analyzing the evidence he finds and using his background knowledge in that analysis. This is a book that genealogists everywhere will enjoy. I can't wait to read the next novel in the series. 4.5 stars. In the last couple of weeks, I received an invitation to a genealogical event that is being held about an hour or so from my home today. The invitation from the genealogical society's Facebook page simply called it Genealogy Day. There was no further information on the event other than a start time and a location. As someone who would be coming from a distance, I wanted to know if it would be worth my while to attend the event. I began searching for more information. I tried the society's web site. There was nothing on there about Genealogy Day. I looked at the web site of the library where it was being held. It wasn't even on the calendar for the library. I tried Google and found nothing more. Finally, I sent a message to the person associated with the society who had issued the invitation to me. I found out that there was no program. It was just a day where persons could get help from local society members with their research. They would also do a little book shelving or whatever needed to be done in the genealogical section of the library. I decided that it was not worth my time and gasoline expense to make the trip. It would have been much easier for me to make that decision if the Facebook page had included that information or if the information had been available in the obvious places of the society's web site or library's web site. Perhaps such a day is successful for some societies with careful planning and the right type of marketing; however, in my experience, these types of events draw few persons needing the help. It seems to me that the event would have been more successful if they'd had some sort of speaker for a portion of the time and then offered assistance with research. Maybe there could have been a lecture on researching in that specific county with an emphasis on records locally available. For the event being held, even someone planning to attend because s/he needed help would have benefited from a suggestion to write down his/her research problem, what is known (and documented), sources already consulted, search terms used, and results (including negative results). Those things would have been useful to the person trying to be of assistance to the individual. Sometimes societies assume that people know what their "Genealogy Day" is, but with the reach of social networking and the Internet, they need to realize that individuals from "away" are going to see their events. Full information needs to be available somewhere online. The link to that information needs to be included whenever an "invite" is sent. Kavasch, E. Barrie. A Student's Guide to Native American Genealogy. Phoenix, Ariz.: Oryx Press, 1996. The title of this book is somewhat misleading. Although it purports to be a book devoted to genealogical research of Native American ancestry, in many ways it is more of a political commentary with some information on ethnography, sociology, with a very little bit of genealogy thrown into the mix. While social history is an important component to genealogical research because it makes our ancestors "come alive," the author never explains the connection. The strength of the book are the bibliographies on various topics related to Native Americans, although many of the sources will only be of minimal assistance to those researching their Native American ancestors. The book, of course, is dated. The Internet was in its infancy when this book was published, and the author offers only one potential use of it in the narrative portion of the book -- to chat with others. There was a bibliography later in the book which did offer a few links, some of which used the old gopher protocol as a mode of access. The author missed opportunities to discuss the various types of sources and what each might tell a researcher. There are lists of repositories which may be useful to today's researchers, although today's researchers will want to check to see if the repositories have Web sites and whether they still exist in the same location, have moved to another location, have merged with another organization, or have completely disappeared. It is clear that the author of this book never envisioned the types of resources that are currently available via the Internet. While this book may offer a very dated introduction for a younger researcher, other overviews of Native American genealogical research or overviews dealing with specific tribes are probably more useful. Yesterday, we began looking at my great grandfather's brother, Samuel Lantz. We covered his life in census records (with a few others thrown in) through the 1880 census. Today, we will conclude the installment on him. From several records below, we know that Samuel and Elizabeth moved from Michigan to Missouri. Information from family members indicates that it was about 2 miles south and a little east of Holden in Johnson County. These people say that they lived there from about 1882 to 1885 before moving on to McPherson County, Kansas, where Samuel's father Levi died and is buried. We pick up their trail again in the 1895 Kansas census. 1895 Kansas state census, Greenwood County, Kansas, population schedule, Madison, p. 30 (written), dwelling 180, family 190, S. E. Lantz family; digital image, Ancestry.com (http://www.ancestry.com : 16 Sept 2012); citing roll v.115-55. 1900 U.S. Census, Greenwood County, population schedule, Madison, p. 99B (stamped), supervisor's district (SD) 4, enumeration district (ED) 55, sheet 6B, dwelling 115, family 115, lines 61-68, Samuel Lantz family; digital image, Ancestry.com (http://www.ancestry.com : 15 Sept 2012); citing NARA microfilm publication T623, roll 481. 1905 Kansas state census, Greenwood County, population schedule, Madison, p. 16 (written), dwelling 101, family 107, lines 9-13, S. E. Lantz family; digital image, Ancestry.com (http://www.ancestry.com : 16 Sept 2012); citing roll KS 1905_60. 1910 U.S. Census, Lyon County, Kansas, population schedule, Center, p. 48 (stamped), supervisor's district (SD) 4, enumeration district (ED) 41, sheet 5A, dwelling (blank), family 6, lines 18-19, Samuel Lantz family; digital image, Ancestry.com (http://www.ancestry.com : 15 Sept 2012); citing NARA microfilm publication T624, roll 445. 1920 U.S. Census, Lyon County, Kansas, population schedule, Center Twp., p. 44B (stamped), supervisor's district (SD) 104, enumeration district (ED) 44, sheet 10B, dwelling 193, family 194, lines 73-75, Samuel Lantz family; digital image, Ancestry.com (http://www.ancestry.com : 15 Sept 2012); citing NARA microfilm publication T625, roll 668. --, Jephha, brother, M, W, 67, S, Illinois, Pennsylvania, Pennsylvania, carpenter, house corp.
1925 Kansas state census, Lyon County, population schedule, Center, p. 13 (stamped), dwelling 87, family 87, lines 29-31, S. E. Lantz household; digital image, Ancestry.com (http://www.ancestry.com : 15 Sept 2012); citing roll 84. By 1930, Samuel and his brother Jephtha were living with Samuel's daughter Mable. 1930 U.S. Census, Lyon County, Kansas, population schedule, Center, p. 51A (stamped), supervisor's district (SD) 10, enumeration district (ED) 56-8, sheet 12A, dwelling 248, family 248, lines 22-31, Ray Prova family; digital image, Ancestry.com (http://www.ancestry.com : 15 Sept 2012); citing NARA microfilm publication T626, roll 709. Samuel's wife Elizabeth died in 1932. She is buried in the Blakely Cemetery in Madison, Greenwood County, Kansas. Find-a-Grave has a photo of the double tombstone. Samuel moved in with his son Levi at some point. They moved to Oklahoma, which must have been somewhat difficult for a man of his age. 1940 U.S. Census, Haskell County, Oklahoma, population schedule, Stigler, p. 191 (stamped), supervisor's district (SD) 2, enumeration district (ED) 31-16, visit 46, lines 29-31, L. J. Lantz family; digital image, Ancestry.com (http://www.ancestry.com : 15 Sept 2012); citing National Archives microfilm publication T627, roll 3297. Lantz, L. J., head, M, W, 61, M, Michigan, proprietor/auto retailer/Chevrolet Co., father born in Indiana, mother born in Indiana, mother tongue German, man. Chevrolet Co.
--, Verna E., wife, F, W, 61, M, Penn. 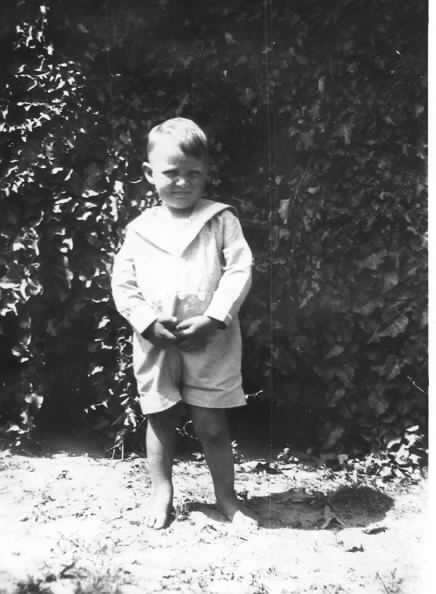 Samuel died 24 May 1941 in Stigler, Haskell County, Oklahoma according to family sources. He was taken back to Kansas to be buried beside his wife in the Blakely Cemetery in Madison. The year 1941 is supported by his tombstone which is online at Find-A-Grave. Find A Grave, memorial 28120213, digital image, (http://www.findagrave.com : accessed 16 Sept 2012), photograph, gravestone for Samuel E. (1848-1941) and Elizabeth (1850-1932) Lantz, Blakely Cemetery, Madison, Greenwood County, Kansas. I've still got lots of work to do on Samuel and his family, but the information I dug up has provided additional details on the life of both Samuel and his brother Jeptha. Jeptha is apparently also buried at Blakely Cemetery. There is a 1932 date of death on his Find a Grave memorial, but no one has yet taken a photograph of his marker. Samuel Lantz was the brother of my great grandfather Abraham Lantz which makes him my great grand-uncle. I actually knew quite a bit about Samuel, but I had not completed all of my census research to the present day for him. In 1850 and in 1860, he is enumerated in his father Levi's household. 1850 U.S. Census, Holmes County, Ohio, population schedule, German Twp., Dist. 75, p. 224 (stamped), dwelling 1918, family 1952, line 8, Samuel Lance; NARA microfilm publication M432, roll 696. 1860 U.S. Census, McLean County, Illinois, population schedule, Dry Grove Twp., p. 94 (stamped), dwelling 648, family 632, line 3, Samuel Lantz; NARA microfilm publication M653, roll 204. In 1870, he is enumerated as the head of a household of a Staubus family that had recently arrived in Illinois within the last 3 years or so from Virginia. 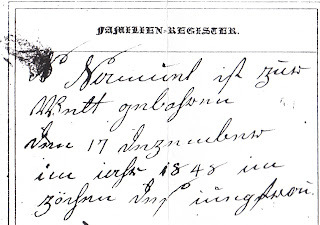 1870 U.S. Census, McLean County, Illinois, population schedule, Danvers Twp., p. 344B (stamped), dwelling 220, family 221, line 1, Samuel Lantz; digital image, Ancestry.com (http://www.ancestry.com : 15 Sept 2012); citing NARA microfilm publication M593, roll 259. It should be noted that Samuel's father, Levi, had moved to Howard County, Indiana and is enumerated there. His mother, Barbara, is in the 1870 mortality schedules for Howard County, Indiana. [By the way, she is buried in the Amish Family Cemetery which was located on their property in Howard County. It was transcribed in a 1968 publication, but my efforts (and my friend who has relatives in the area and her relatives' efforts) to locate the cemetery have failed. If any reader lives in the area and can find it and photograph the few markers there, I would greatly appreciate it.] My great-grandfather, Abraham, Samuel's brother, had remained in McLean County, Illinois. Samuel married Elizabeth Kennedy on 27 August 1871 in Kokomo, Howard County, Indiana according to descendants of this line. I do not have an official record and need to obtain one. Her father is supposed to be a Joseph Kennedy. I have seen her mother listed as both Anna and Nancy Lantz. Her family claims that she was a minister (at least in later years in Kansas), but none of the censuses list her as being a minister, and I have not had the opportunity to search church records and newspapers which might provide evidence of this. By 1880, the family had moved to Michigan. I found a birth record for one of the children online. Michigan Births, 1867-1902, p. 182, 22 Oct 1876, record 317; digital image, Family Search (http://www.familysearch.org : 15 Sept 2012); citing FHL film 2320450. Oct 22, 1876 - Lantz, Ora L. - F, W - birthplace: Mottville; parents: Samuel E. Lantz, res. Mottville, b. Ohio, farmer; Elizabeth Lantz, res. Mottville, b. Indiana. By the way, family information says that her middle name was Rebecca, so apparently the birth register has an incorrect middle initial. By the way, Gepha is really spelled Jeptha. One of my 3rd great grandmothers is Mary Keim (b. abt. 1779; d. 1828). The focus of today's blog post is her brother Peter Keim (or Kime as it is most often found in census records). Peter was born 16 September 1781. (I guess we are celebrating the 231st anniversary of his birth today.) As I was looking for someone in my database with an event on today, I noticed that I had not done much work on this person. That was basically all I knew. I did not have time to do a great deal of research, but I did make progress by getting the census records for Peter from 1810 to 1870. 1810 U.S. Census, Somerset County, Pennsylvania, Elk Lick, p. 425 (written), line 2, Peter Kime; digital image, Ancestry.com (http://www.ancestry.com : accessed 15 Sept 2012); citing NARA microfilm publication M252, roll 53. 1820 U.S. Census, Fayette County, Pennsylvania, Wharton, p. 166 (written), line 3, Peter Kime; digital image, Ancestry.com (http://www.ancestry.com : accessed 15 Sept 2012); citing NARA microfilm publication M33, roll 103. 1830 U.S. Census, Fayette County, Pennsylvania, Wharton, p. 171 (written), line 25, Peter Kyme; digital image, Ancestry.com (http://www.ancestry.com : accessed 15 Sept 2012); citing NARA microfilm publication M19, roll 162. 1840 U.S. Census, Holmes County, Ohio, German Twp., p. 249 (written), line 11, Peter Keime; digital image, Ancestry.com (http://www.ancestry.com : accessed 15 Sept 2012); citing NARA microfilm publication M740, roll 404. 1850 U.S. Census, Holmes County, Ohio, population schedule, German Twp., Dist. 75, p. 210B (stamped), lines 30-31, dwelling 1749, family 1781, Peter Kime household; digital image, Ancestry.com (http://www.ancestry.com : accessed 15 Sept 2012); citing NARA microfilm publication M432, roll 696. 1860 U.S. Census, Tuscarawas County, Ohio, population schedule, Sugar Creek Twp., Shanesville post office, p. 367A (stamped), line 39, dwelling 616, family 624, Peter Kein; digital image, Ancestry.com (http://www.ancestry.com : accessed 15 Sept 2012); citing NARA microfilm publication M653, roll 1043. 1870 U.S. Census, LaGrange County, Indiana, population schedule, Greenfield Twp., Brighton post office, p. 211A (stamped), lines 27-31, dwelling 58, family 60, Eli Kime household; digital image, Ancestry.com (http://www.ancestry.com : accessed 15 Sept 2012); citing NARA microfilm publication M593, roll 333. I also located Eve Neff in the 1830 census. 1830 U.S. Census, Tuscarawas County, Ohio, Sugar Creek, p. 77, line 18, Eve Neff; digital image, Ancestry.com (http://www.ancestry.com : accessed 15 Sept 2012); citing NARA microfilm publication M19, roll 141. It is possible or even probable that her marriage to Peter Kime was also her second marriage and that we do not know her maiden name. Determine if Peter or his father are enumerated in the 1790 and 1800 censuses. Locate a marriage for Peter in Pennsylvania to determine name of first wife. Seek evidence of Mary's death in Pennsylvania or Ohio between 1830 and 1839. Seek to discover an earlier marriage for Eve. Determine the names of Peter's children. Locate evidence of Peter's death and burial in either LaGrange or Elkhart Counties, Indiana. Check probate and estate records. There are many more things that I could do, but I will save those for a later date. Yesterday, my nephew told his Facebook friends that he was going to be teaching his wife how to play dominoes. That kind of caught my attention because the subject of dominoes came up recently at a Thornton family funeral and brought back a flood of memories. My first cousin once removed Ruth Thornton Hilliard had died. I was chatting with her son Joe. He asked how my brothers who couldn't attend the funeral were. I was filling him in. Then he brought up a memory about my brother Jim. It seems that Joe and Jim were in the same Scout troop. When they drew names at Christmas one year, Jim drew Joe's name. Jim got Joe a set of dominoes. When Joe told me this, I immediately knew the significance of this. You see my grandfather Tom and Joe's grandfather Woodie were brothers. The two of them along with Rubel Moss and Kirby Whitaker played dominoes just about daily. They played down at Sam Moon's store in Becker, but they also played at one another's homes. I can remember going to Pappaw's house on many occasions where I'd see the four of them playing. When I was sharing with my brother Jim later, he remembered them playing at the store more than I did. That was probably because I was a girl and got left with Grandmother more often. I learned to play by watching them. They always played double twelves, but I was elated when I got a pair of colored double nines one year. I still have them. I was grown before I learned other domino games like chicken foot. It was always the pure game when you were at Pappaw's house. Dominoes also brought back another memory. It was a memory of Sidney Duncan, a crippled man who lived in Baldwyn, Mississippi. My brother Jim pastored a church on the outskirts of Baldwyn in a community called Pratts for several years. They often did things with the group from the church in Baldwyn of which Sidney was a member. I can remember us picking up Sidney to go to area-wide church meetings. I also remember going with my sister-in-law to visit Sidney at his business, a domino parlor. As I recall, his domino parlor was beside the railroad in Baldwyn. We never stayed long. Although I doubt there was gambling and it was really more of a place people could just join a game, it wasn't a place little girls got to stay. I am sure that I sometimes wanted to stay to play, but it was okay, because I knew there'd be a game in the Thornton family at some point! Yesterday Thomas MacEntee posted a link to the news that Georgia was about to become the first state without a publicly accessible state archives. You'll find the article here: http://www2.wsav.com/news/2012/sep/13/breaking-georgia-closes-state-archives-ar-4538200/. The hours were already down to only a few on Fridays and Saturdays. Now it will be by appointment only (and those will be limited). I immediately realized that I needed to prioritize a weekend trip to Georgia to do some research in the next 6 weeks. Three weekends are already out -- one I have to work, one I'll be in Mississippi, and another I have a meeting. I also realized that I need to make the most of the few hours I'll have on the weekend I go. It's only about a 3.5 to 4 hour trip down to Atlanta. I'll want to go down the evening before so that I can be there when the doors open. I will also want to have my research plans in order. That means that I'll be reviewing my notes on about 3 families who made brief stops in Georgia en route to Alabama so that I can attack the problems efficiently and locate what I need quickly. Now I just have to identify which weekend I'll be heading down for an overnight trip. It's a shame that they are closing instead of entering a partnership with a state university such as University of Georgia to provide access to their collections. I realize that UGA is not in Morrow, but it seems that a partnership is what is needed, even if it means relocating the archives. Today's installment in my juvenile literature reviews is more of a history book than a book about family relationships or genealogical research. I suspect that few budding young genealogists will have documented their story back to the Medieval Period, although there may be a few who can do so with the help of a few adults. If they have, this installment will probably offer them a glimpse at what life might have been like for a female ancestor living in that period. Hopkins, Andrea. Damsels Not in Distress: The True Story of Women in Medieval Times. (The Library of the Middle Ages.) New York: Rosen Publishing Group, 2004. This book offers a nice introduction to European women and the role they played during the Middle Ages. It shows that women had more rights than they had at later periods and often served alongside their husbands. The book addresses women of all classes, women in the home, women rulers and leaders, women who became nuns, and women in business. It is a great introduction to younger readers for this period and offers a bibliography of additional resources for further study. 3.5 stars. Perry, Anne. Weighed in the Balance. New York: Fawcett Columbine, 1996. Oliver Rathbone takes on a slander case which he has little chance of winning. He enlists the aid of William Monk to investigate on his behalf. Monk's evidence shows that the person being accused of the murder is the only one who could not have committed it, and it appears the chief suspect of the murder would be Rathbone's client. It's a novel involving European politics. The pacing on this novel as with most attorney-driven novels was a bit slow for me. It's been awhile since I have read other books in this series, but I'm glad that I had read them. A newcomer to the series starting with this book would have found the main recurring characters undeveloped. It was, however, an intriguing puzzle that kept the reader wondering how the crime was committed and by whom until the final pages. I definitely prefer the author's Thomas & Charlotte Pitt series to the William Monk one. 3 stars. Arnaldur Indriðason. Silence of the Grave. New York: Thomas Dunne Books/St. Martin's Minotaur, 2006. When a skeleton is found outside Reykjavik, Inspector Erlandur begins his investigation even though the full skeleton cannot be exumed for a few days. The archaeologist and a medical student believe that the bone that is first found is probably at least 70 years old so the detective focuses his efforts on the 1930s and 1940s. We are introduced to a horrifying tale of domestic violence and the account of an American base on Iceland. While the Icelandic names make for difficult reading, the story itself is quite absorbing. In the beginning, I had difficulty sorting out the past story and the present story, but as the story moved on, I managed to navigate both lines. My biggest criticism lies in the cursing in the dialogue. I did not feel it was critical in any place and could have been handled without including the bad language as was done in other parts of the story. I wondered if it was present in the original Icelandic or if it was introduced by the translator into the narrative. Stories involving domestic violence are never easy to read, but this one was well-told and worth reading. 3.5 stars. Stabenow, Dana. Fire and Ice. New York: Dutton, 1998. This series began when the author's favorite editor moved to another publisher. Since her contract did not allow for spin-offs, a new trooper character was invented for this series. Liam Campbell, freshly demoted because he wasn't watching those under him as much as he should have, is sent to a remote Alaskan village. He literally walks off the plane into his first murder investigation. He encounters the former love of his life. Before he's even done with processing that scene, he is called to a shooting. I was not all that pleased with the adultery and romantic scenes. The characters did grow on me over the course of the book. I'll probably eventually get around to the second in the series, but it's not that high of a priority. I prefer the author's Kate Shugak series. 3 stars. Shreve, Anita. Resistance. Boston: Little, Brown, 1995. An American plane is downed near a Belgian Village during World War II. Pilot Ted Brice escapes in the woods with the aid of a small boy. He's taken to the home of Henry and Claire who are members of the resistance. The plan is to hide him there until he can make an escape through France back to England. The danger for those in the village increases when one of the villagers provokes the Germans.This is a Holocaust story and a love story. Having read other books on this period, the ending is a bit predictable. There was a lot that could have been included that was omitted, and the ending seemed a bit rushed. It's a book that a lot of women will enjoy reading. 3.5 stars. Robinson, Marilynne. Gilead. New York: Picador, 2006, c2004. There are some books you devour; there are some books you savor. This one fits the "savor" category. The narrator is Rev. John Ames. The audience is his son. He is reflecting back on his life as he knows it will soon be coming to an end. He's lived all but two years of his life in the small town of Gilead, Iowa. The ministerial life is all he's ever known. His grandfathers and father were all clergymen. It's not a book of action; it's a book of contemplation. Robinson's prose is quite poetic and very deserving of the Pulitzer prize that it won. 4 stars. Grisham, John. Calico Joe. New York: Doubleday, 2012. Shelby, Anne. Homeplace. Ill. by Wendy Anderson Halperin. New York: Orchard Books, 1995. This book is a story of one family's experience in one home from older generations to the present. It begins with the 4 great grandparents and gives a young reader an idea of what each family did and continues forward with each generation to the child. It's a great book for explaining family relationships to young readers. While I enjoyed the illustrations, they are probably the biggest problem with the book. In places they are quite busy and probably trying to do too much for the age level which would be reading this. I do, however, think that they can encourage much more discussion about the daily lives of our ancestors with a parent who is willing to read this book aloud and take the time to really discuss the pictures. 3.5 stars. As I began to ponder the quote, I saw some parallels to some of our research in genealogy. When an ancestor dies, we no longer have the information about our family that person knew in one piece. We have to take a record here and a record there to try to piece back what that person knew about himself and his family. We have to make sure that the pieces we gather are in their right places, but it isn't always an easy task. We use the Genealogical Proof Standard to guide us as we are reassembling that mirror of our ancestor's life. Mayor, Archer. Open Season. New York: Putnam, 1988. When members of a jury that served on a murder case about three years previously in Brattlesboro, Vermont are threatened and even killed, Lt. Joe Gunther informally reopens the case. It's not long before he and others are in danger as well. Who is the mysterious person behind the "ski mask"? Was the person brought to trial for the old murder case framed? It's up to Joe to find out before he meets the same fate as others. While I enjoyed this first installment, I really didn't like some aspects of the case, primarily because some parts were out of my comfort/toleration zone. If I read additional installments, I will want to make sure that those elements are not present in future installments. 3 stars. It's Sunday again . . . time for another entry that focuses on one of my ancestors and religion. Since I concentrated on a New England ancestor last week, I decided to focus on a Southern one this week. This one resided in Alabama, which is where I've been for much of the last week at the Federation of Genealogical Societies Conference. Today's focus will be upon Ashley Aldridge, my 3 great grandfather. He was born somewhere around 1801, probably in Tennessee. The family migrated to the Mississippi Territory in the part known today as Alabama. He married his first cousin Celia Aldridge sometime around 1824. In some of my early correspondence with another researcher, I was told that Ashley Aldridge was a Methodist minister. The 1850 census, of course, list him as a farmer. The 1860 census for Fayette Co., Alabama does list him as a Methodist minister. (My great grandfather Cape Thornton is listed as Capers Aldridge in this census. His mother had died at childbirth, and he was being reared by Ashley and Celia. Our family's spelling of Cape's middle name is Capus. His first name was Andrew.) There is additional indication that he was very influential in the Methodist Church and may have even been a lay minister. Anson West's History of Methodism in Alabama (Spartanburg, S.C.: Reprint Co., 1983; orig. pub. Nashville, Tenn. : Pub. House, Methodist Episcopal Church, South, 1893) indicates he was involved in the Methodist Church in Walker County. One quote from that book calls him an "exhorter" which leads you to believe that he did fill the pulpit on occasion. There were a number who filled the offices of class leader and steward who were men of good influence in that region. There were a number of exhorters who did good in the divine cause. WILLIAM CRUMP, BENJAMIN JONES, JONATHAN SHERLY, JESSE FREEMAN were all worthy of mention. ASHLEY ALDRIDGE and ROBERT DAVIS, men of but little education, were long in that section. One thing we do learn from this is that he was not well-educated. I have somehow lost what I remember to be a source over the years. When I first began researching my family, I had a very primitive database that did not allow one to input more than 10 fixed length lines of text in a notes field. This had to suffice for your citations (which I heavily abbreviated) as well as info learned. I ran out of space and filed some information, but I apparently misfiled the piece of information that I remember about Ashley. I remember seeing some sort of church record in a special collection that I intended to investigate in the future. I'm thinking that the repository was the Alabama Dept. of Archives and History in Montgomery, but I'm not sure. I seem to think it mentioned either a specific church or indicated that he had performed some baptisms or something like that. I'm hoping that I will run across it again at some point in the future. I found it in the days when what would become the Internet was still searched mostly through text-based browsers or through menus. I'm hoping that I'll run across the item again as I continue to work on reorganizing my older files. His wife Celia's obituary mentions that she was a long-time member of the Methodist Church. Ashley died probably before 1870 as Celia is enumerated as head of the household in Sanford County.